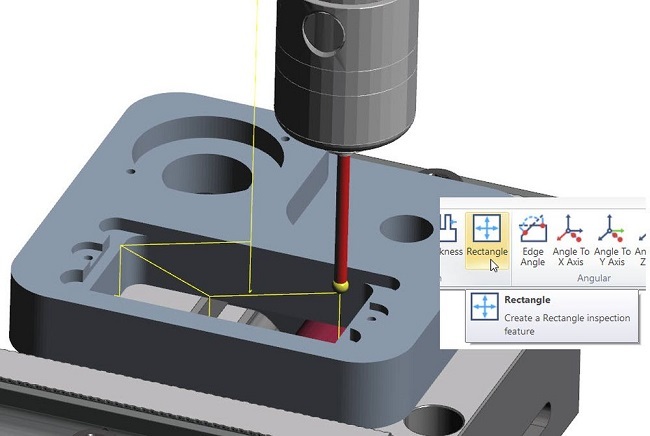 EDGECAM Inspect combines industry leading metrology tools and know-how from Hexagon Manufacturing Intelligence with cutting edge manufacturing expertize from Hexagon Production Software. Hexagon Production Software can now offer offline programming of your inspection routines which communicates with the machine tool in both directions. With Inspect, we have the ability to alter tool or work offsets and generate a report with the data returned from the machine tools. Inspect, also available as EDGECAM Inspect is kind of a purpose-built metrology solution for the CAM user. What that allows us to do is a number of things that are very powerful for us and it's rather unique in the marketplace, compared to other metrology solutions for a machine tool. First of all it allows us to leverage a large library of postprocessors that are available for Edgecam. What we've done is taken a set of tools for measurement and bolted them on top of the CAM system. Along with those postprocessors, it gives us a very robust simulation engine. That gives us a fully accurate kinematic simulation of the motion of the machine. In addition to that, it lets us build our toolpath cycles right alongside our measurement cycles in the same workspace. That's a clear advantage for the users, where they don't have to get out of one workspace solution for their toolpath and into another solution for their measurement cycles and then somehow take those two outputs and combine them to send to the machine. Everything gets sent to the machine as a single package. What this allows us to do by sending a single file to the machine? For example, that contains both the toolpath as well as the measurement cycles. It gives us the ability to measure the component and machine the component. For example, in a roughing operation, measure the component again for stock condition and potentially make adjustments to the machine tool for error correction, that gives us a true closed digital loop system for manufacturing.